On March 11, President Trump released his administration’s fiscal year 2020 budget. As it goes for every presidential budget, the proposal stands zero chance of being implemented in its entirety. The condensed version of the budget can be found here. The Health Resources and Services Administration’s (HRSA) budget request does not request funding for the Rural Hospital Flexibility program, State Office of Rural Health, and the Rural Residency Planning and Development. The lack of the funding has been consistent with HRSA budget requests in recent years. With Congress passing into law the Reauthorization of the SORH program at the end of the 2018, we remain hopeful that Congress will fund the SORH line as called for in recent law. Medicaid: The budget calls for trillions in cuts to the growth of Medicaid (and Medicare). The administration is seeking to overhaul Medicaid through block grant funding. By implementing block grant or per capita caps, this would cut $1.5 trillion over 10 years in Medicaid spending. 340B: The budget also calls for giving HRSA more control over 340B by asking for “broad regulatory authority for 340B to set enforceable standards of program participation.” The budget requests Congress require hospitals to report their 340B savings and explain how the money is used. This was included in last year’s budget, and there were a couple bills introduced last Congress mirroring this. If Republicans couldn’t move this last year, there is little chance in the new Congress. Bad Debt and Uncompensated Care: The budget calls for bringing “transparency to several Medicare payments to hospitals.” The proposal calls for reducing the reimbursement for bad debt from 65 percent to 25 percent over three years starting in fiscal year 2021. Rural hospitals with fewer than 50 beds, critical access hospitals, rural health clinics and FQHCs would be exempt. The budget also proposes to cut uncompensated care payments. Starting in fiscal year 2021, uncompensated care payments would be made to hospitals based on their share of charity care and non-Medicare bad debt, as included on their Medicare cost-reports. The bad debt proposal would save $38.5 billion over 10 years and the uncompensated care proposal would save $98 billion over 10 years. Others: Another hospital-related proposal of note would consolidate the Hospital Value-Based Purchasing Program, Hospital-Acquired Condition Reduction Program and Hospital Readmissions Reduction Program into a single program. House Democrats introduced sweeping “Medicare for All” legislation, providing the most detailed plan to overhaul the current healthcare system by enrolling all U.S. residents in a single-payer, government-run health plan. It would cover a more expansive set of benefits than the current Medicare program and restructure payment for institutional healthcare providers such as hospitals and skilled nursing facilities. The measure does not include a price tag or specific proposals for financing the new system, which analysts estimate would cost tens of trillions of dollars over a decade. The lead sponsor, Rep. Pramila Jayapal (D-WA), said she will release a separate list of suggested funding mechanisms. The single-payor, government-run healthcare system under Medicare for All would cover a range of services at no out-of-pocket cost to patients. The measure would not only cover primary and preventive care, as well as inpatient and outpatient hospital services, but also long-term care support services that are not currently covered by Medicare. Every insurance program in the U.S. would be changed, leaving only the veterans’ health program and the Indian Health Service in place. Providers such as hospitals or skilled-nursing facilities would be paid through a global budget so that hospitals would receive a quarterly lump sum to cover items and services. Additionally, individual providers would be paid based on a national fee schedule set by the HHS secretary. A section-by-section summary of the bill, along with other information on the legislation, can be found here. On January 18, President Trump announced a deal to temporarily reopen the federal government and end the longest shutdown in U.S. history. The deal funds the remaining federal agencies until February 15, giving lawmakers more time to try to work out a compromise on the immigration and border security issues. President Trump called on the Senate to bring the proposal to the floor for a vote immediately. The House is hoping to clear the bill by unanimous consent. The agreement is considered the product of negotiations between the Senate’s top leaders, Majority Leader Mitch McConnell (R-KY) and Minority Leader Chuck Schumer (D-NY), who met on Thursday following the failure of two measures in the Senate to reopen the government. While the shutdown did not impact HHS-related programs, some rural health programs and projects could be delayed due to the month-long shutdown. Projects including hospitals and addiction treatment facilities backed by grants awarded last fall by the USDA’s rural development program could be impacted. Congress now has less than three weeks to come up with a solution for a border security deal, however most lawmakers believe another shutdown this year is unlikely. On January 17, the Senate passed by voice vote legislation to extend certain Medicaid policies known as “extenders.” The measure will go to the president’s desk for signature since the House passed the bill. The extenders were passed late last session by both the House and the Senate but through different bills that were never signed into law. On January 18, Senate Health Committee Chairman Lamar Alexander (R-TN) and Ranking Member Patty Murray (D-WA) introduced legislation that extend community health centers and four other federal health programs. The legislation (S. 192) would provide five years of mandatory funding for the Community Health Center Program, National Health Service Corps, Teaching Health Center Graduate Medical Education Program, Special Diabetes at the NIH, and Special Diabetes for Indians. Mandatory funding for the programs is set to expire after September 30, 2019. The Senate HELP Committee is scheduled to hold hearings on the programs and will likely vote to advance the bill later this year. NOSORH has resources to help you and your state partners prepare for the National Rural Health Association Policy Institute being held February 4-7, 2019, in Washington, D.C. One-page state profiles, like this one from South Carolina, are available to help State Offices of Rural Health (SORH) document the impact of their work. . For help in completing your state’s profile, please contact Donna Pfaendtner at donnap@nosorh.org no later than Friday, January 11, 2019. A SORH factsheet will be provided for your use at the Policy Institute and Hall Render staff will be available to join you on Hill visits. While in D.C., be sure to attend the NOSORH Members Meeting on Monday, February 4th at 6:00 pm ET. We do not have a room assignment yet but be looking for more information to come next month. Lastly, NOSORH will be hosting the webinar “Preparing to Engage with Legislators & Policymakers” on January 17th at 3:00 pm ET to help you get ready. Stay tuned for more details. The Policy Committee invites all State Rural Health Associations to join the monthly meeting of the NOSORH Policy Committee. Updates will be provided on federal regulatory issues, efforts to reauthorize the SORH program and other policy issues. While the House and Senate were out of session for most of October, the House version of the State Office of Rural Health Reauthorization bill (H.R. 5641) continued to gain momentum picking up three new cosponsors. In addition to gaining House Energy and Commerce member Morgan Griffith (VA), Reps. Steve Russell (OK) and Elise Stefanik (NY) also signed on a cosponsor. NOSORH met with the Energy and Commerce Committee this fall and believes it is likely the SORH reauthorization bill advances next time the committee addresses public health legislation. The Senate has already passed the reauthorization bill. If there is a House member of the Energy and Commerce Committee in your state, please contact their staff and urge them to cosponsor H.R. 5641. On October 3, 2018, the “Substance Use-Disorder Prevention that Promotes Opioid Recovery and Treatment for Patients and Communities Act” or short hand—the SUPPORT for Patients and Communities Act (the “SUPPORT Act”)—was approved by the Senate and sent to the President. The President has now signed the SUPPORT Act into law. The SUPPORT Act is the compromise version of the opioid response bills approved by the House and Senate earlier this year. Partial repeal of the “IMD exclusion”: This provision partially lifts the ban on use of federal Medicaid program funding for SUD treatment at facilities that are an institute for mental disease (IMD) with more than 16 beds (commonly known as the “IMD exclusion”). Under the provision, Medicaid programs may pay for care at an IMD facility for up to 30 days of residential SUD treatment annually per beneficiary, regardless of severity of diagnosis. The partial lifting of the IMD exclusion is only effective for the next five years. This provision does not mandate the coverage benefit by the states. It remains to be seen whether SUD treatment providers will enroll in the Medicaid program for such limited relief from the IMD exclusion. CAREER Act and Telehealth: The CAREER Act provides a grant program to incentivize initiatives that support individuals in SUD treatment and recovery to live independently and participate in the workforce. Grant funding is earmarked for defined activities, including promoting telemedicine infrastructure and technology adoption, as well as case management, case coordination, or peer recovery support services. Grant funds will be awarded to the states based upon the rate of drug overdose deaths, rate of unemployment, and rate of labor force participation in the state. In addition to expanding some access to SUD treatment to Medicare beneficiaries via telehealth services, the bill also directs CMS to issue guidance to states on options for providing services via telehealth that address SUDs under Medicaid, including for federal reimbursement of services addressing high-risk individuals, for provider education, and for telehealth services to students in school-based health centers. Medicare SUD Treatment Access: The bill creates a four-year demonstration project, to be developed by CMS in consultation with specialists in the field of addiction, clinicians in primary care, and a beneficiary group, that would allow Medicare beneficiaries to receive MAT and certain wraparound services at an Opioid Treatment Program (OTP). Currently, OTPs are not recognized as Medicare providers, meaning that Medicare beneficiaries receiving MAT at OTPs must pay out-of-pocket. The House and Senate returned to Washington in September for their final legislative work period before the 2018 mid-term elections. With the Senate having already passed the State Office of Rural Health (SORH) Reauthorization bill, the focus shifted to the House. The House bill, H.R. 5641, picked up a critical cosponsor with Rep. Morgan Griffith (R-VA) agreeing to sign-on. Griffith is a member of the House Energy and Commerce Health Subcommittee which has primary jurisdiction over SORH legislation. NOSORH met with the Energy and Commerce Committee during September and believes there is a good chance the Committee advances the SORH reauthorization bill the next time the committee addresses public health legislation. On September 13, the House and Senate conferees approved the conference report for the FY 2019 DoD and Labor-HHS spending bill (H.R. 6157). Five days later, the Senate passed the conference report by a 93-7 vote . On September 26, the House easily passed the conference report thus sending the FY 19 spending bill to the President which he is expected to sign. The SORH number for FY 19 came in at $10,000,000 which is the same number as FY 18. When the House originally passed the FY 19 Labor-HHS bill, the funding was $11,000,000 for SORH. The Senate passed version was at $10,000,000. Conferees went with the Senate number. Other rural health related items included in the conference report were Medicare Rural Hospital Flexibility grants which were funded at $53,609,000. This is a four million dollar increase over FY 18. Small Rural Hospital Improvement Grant Program was funded at $19,942,000 for FY 19. This is also a four million dollar increase over FY 18. Lisa Davis (far right) speaks on a panel at a Rural Summit held by Senate Democrats. 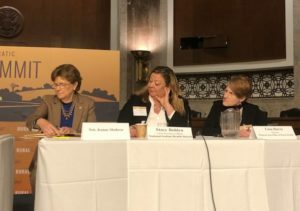 On September 27, Lisa Davis, Director of the Pennsylvania Office of Rural Health, spoke before the U.S. Senate Democratic Steering and Outreach Committee at their annual Rural Summit. The Summit was kicked off by Senate Democratic Leader Chuck Schumer (D-NY) and featured Senators and participants from across the county addressing issues facing rural America. Lisa Davis spoke on a panel addressing health care issues in rural America. The panel was led by Senators Bob Casey (D-PA) and Tina Smith (D-MN) and moderated by Sen. Jeanne Shaheen (D-NH) and Heidi Heitkamp (D-ND). Senators Smith and Heitkamp were original cosponsors on the SORH Reauthorization bill. Davis thanked the Senate for passing the State Offices of Rural Health Reauthorization Act of 2018 and spoke passionately about the challenges facing rural health. On April 26, House Energy and Commerce members Markwayne Mullin (R-OK) and Kurt Schrader (D-OR) introduced the State Offices of Rural Health Reauthorization Act of 2018. The bill (H.R. 5641) is the companion bill to S. 2278 which was passed in March by the Senate Health Education Labor and Pensions Committee. The Senate bill, which was introduced by Senators Roberts (R-KS) and Heitkamp (D-ND), has been cleared for full Senate passage. The next step for H.R. 5641 will be a mark-up before the Energy and Commerce Committee. The Senate Finance Committee held in April to address opioid and substance-abuse disorders in Medicare, Medicaid and other HHS-related programs. The hearing addressed how the programs can adapt and be improved to address the crisis, as well as what the Trump administration and Congress can do to fight the opioid crisis together. The Committee, through feedback from stakeholders and its members, identified areas of bipartisan support. These include the need to evaluate access to and utilization of non-opioid treatment options for managing pain; enhancing data-sharing to promote appropriate health care interventions and strengthen program integrity; and ensuring evidence-based care is available for patients to identify and treat opioid use disorders. On April 24, the Senate HELP Committee held a markup for a number of opioid-related bills. Legislation that passed the Senate committee includes: S. 2680, the “Opioid Crisis Response Act of 2018”; S. 2315, the “Over-the-Counter Drug Safety, Innovation, and Reform Act”; S. 2597, the “Children’s Hospital GME Support Reauthorization Act of 2018”; and S. 382, the “Firefighter Cancer Registry Act.” The following day, the House Energy and Commerce Committee advanced a 60-bill package that touches on everything from FDA approval of pain medicines to how government programs pays for addiction treatment. Congress hopes to pass comprehensive opioid reform before Memorial Day. The Medicare Payment Advisory Commission (MedPAC) recommended Congress to cut pay by 30 percent for certain off-campus emergency departments in urban areas. Off-campus stand-alone emergency departments that are within six miles of an on-campus hospital emergency department would be subject to the cuts. To support this recommendation, MedPAC claims these off-campus facilities have lower patient severity and standby costs than on-campus emergency departments therefore the Medicare payments are askew. In contrast, MedPAC supported the recommendation to allow isolated rural stand-alone emergency departments, or those that are more than 35 miles away from another emergency room, to bill standard outpatient prospective payment fees and Congress provide annual payments to assist with fixed costs. Additionally, the payment advisers discussed a recommendation to make the four current value-based payment programs into a single initiative. This new initiative would judge hospitals on readmissions, mortality, spending, and how patients’ rate their stay. Depending on performance, two percent of a hospital’s Medicare payments would be withheld or earned back. This plan was cited as a good way to simplify hospital reporting programs and move to outcome-based measures. However, the Commission also raised several concerns such as questions on how to weigh the categories, if two percent is enough of an incentive, etc. MedPAC will continue discussions on this recommendation in the fall. Rep. Collin Peterson (D-MN) introduced H.R. 5498 to amend title XVIII of the Social Security Act to extend the floor on the area wage index under the inpatient prospective payment system to certain sole community hospitals and to amend the Public Health Service Act to provide eligibility for certain sole community hospitals to discounted drug prices under the 340B drug pricing program.